They're little monogrammed t-shirts are SO precious! You are such a sweet Mom, I mean "hello" halloween oreos are AMAZING! They are adorable! And how are you feeling lovely!? Oh my gosh! 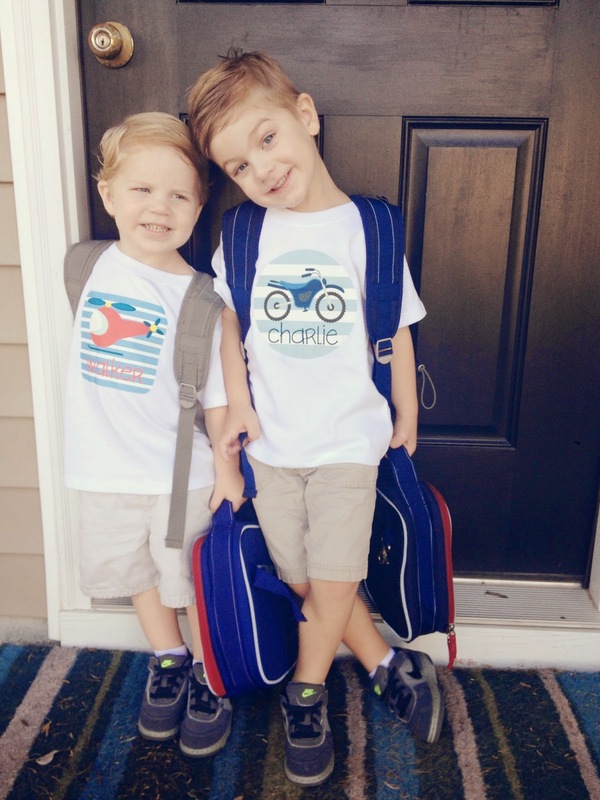 Their shirts are so adorable! You've got two cuties! Oh my gosh they are so stinkin cute! Those shirts were perfect! Hope they love school and you are doing okay with sending them!! I love fall so much :) Your boys are so sweet! We need to get together soon!! LOL! Mom, those aren't on the list!! ;) they are so cute! I freaking love those boys of yours. Halloween Oreos for DAYS!!!!! Fall is my favorite time of year! I always loved back to school time too. New supplies, new shoes, clothes. I love school so much though. AGH, Halloween already!?! Say it isn't so! Hahaha! Kids do call us out on stuff like that, don't they? Cute! Charlie looks so much like you in this photo!! Love their shirts! Hope they are enjoying school thus far.